Clear all jellies reach 110000 points to complete the level. This level has hard difficulty as you need to break lot of blockers with jellies. 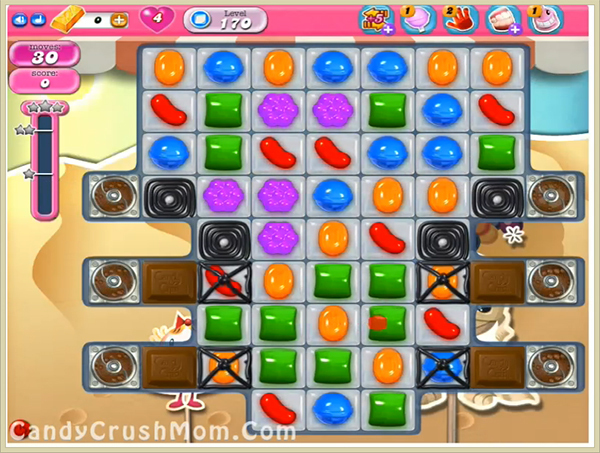 For this level you need to make special combos specially with colorbomb and try to break chocolate in every move so they wont increase and waste move. Try to play more near to jellies so you can break all within 30 moves. We completed this level with 305880 score using lot of special candies and colorbomb that help to reach requirement with three star score.